“Heart of India lies in villages’ of India” – Gandhi. So as the growth of India lies in rural villages. Is the present system neglecting villages? Literacy rate in India is 61%, the growth of India depends on educating rest of India. India is aiming to achieve double digit GDP that can probably be achieved by improving literacy rate – this can be realised from our neighbour (China), having 91% literacy rate with double digit GDP already achieved. Indian GDP agriculture has 17% share with 52% of labour depending on this sector or related sectors and probably mostly uneducated farmers or with only primary education (Proverb: half knowledge is more dangerous than having no knowledge). Rest 48% of labour is dependent on manufacturing and service sectors out of which there is maximum literates. Despite the growth of technology in agriculture sector, our farmers are not able to utilise the same. Despite several schemes and initiatives by government, the literacy rate is still remains stagnant long time. Where as the private sector investments are highly focused in urban India, the education sector is growing at CAGR of 16% in a $40 Billion + market; the question here is “IF all this money is adding to value of the system of present education?” Majority investments plans are focused in urban and metro cities. 70% of Indian population lives in rural India with 65% literacy rate, largely the rural education is limited to primary education secondary education. 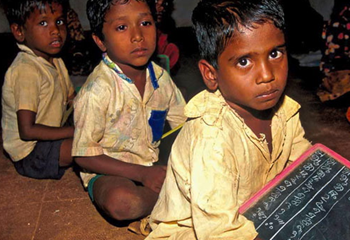 World Bank statistics found that fewer than 40 percent of adolescents in India attend secondary schools. The Economist reports that half of 10-year-old rural children could not read at a basic level, over 60% were unable to do division, and half dropped out by the age 14. Only one in ten young people have access to tertiary education. Out of those who receive higher education, Mercer Consulting estimates that only a quarter of graduates are "employable". An optimistic estimate is that only one in five job seekers in India have ever had any sort of vocational training. Many Indian villagers have engaged themselves in various non-agricultural occupations in the recent years. There is also a common trend among the Indian villagers to migrate to the urban areas to work as labourers or get into alternate professions but not for education. The most basic problems conceived to be are the quality, infrastructure, human capital and finance. This also includes deficiency of management practises. One study found out that 25% of public sector teachers and 40% of public sector medical workers were absent during the survey. Among teachers who were paid to teach, absence rates ranged from 15% in Maharashtra to 71% in Bihar. Only one in nearly 3000 public school head teachers had ever dismissed a teacher for repeated absence. A study on teachers by Kremer etc. found that ‘only about half were teaching, during unannounced visits to a nationally representative sample of government primary schools in India. Infrastructure is adding up to these deficiencies, out of 188 government-run primary schools, it is found that 59% of the schools had no drinking water and 89% had no toilets. A focused management and some basic facilities a private organisation can afford with a better value chain in place. Taking census in place still there is a 40% population that is getting proper education and rest 60% out of which only a portion could able to complete graduation studies. A well-established educational society or an educational organisation in a metro or an urban city with an annual turn over summing to hundred thousands of rupees can make their presence in rural markets. This helps in adding better values to the present system. This might improve average standard of living of individuals in the country, and economic growth is result of it. I still remember a policy laid by Indira Gandhi for banking sector, if a bank has to setup one branch in urban city it has to open two branches in rural India. Can this be applied for education sector as well? Google Editions : Kiss your eReaders goodbye!